Under The Gun sent photographer, Kellie Gannon, to check out Palisades and Famous Last Words at the Agora Ballroom in Cleveland on January 29, 2014. It’s been a few months since I’ve attended a show with the intention of shooting photos. For the first show in too long, I decided to check out Palisades and Famous Last Words headlining the Agora Ballroom on Wednesday, January 29 (when Peabody’s shut down in Cleveland last fall, the crew took over and renovated the Agora Ballroom). Palisades and Famous Last Words are currently co-headlining the ‘Ride or Die Tour’ sponsored by MerchNOW and BryanStars Interviews, featuring support from So Many Ways, One Last Look, and Tear Out The Heart. I arrived at the Agora Ballroom to a smaller crowd than usual, but it was made up for by the amount of energy within the fans. Four guys decided to form their own mosh pit and left no fan untouched. My toe was nearly broken by one, another accidentally shoved a kid face-first into a pillar, blood instantly gushing down the kid’s face. It was chaos, but hey, that’s rock and roll for you. So Many Ways, One Last Look, and Tear Out The Heart were all outstanding opening acts. 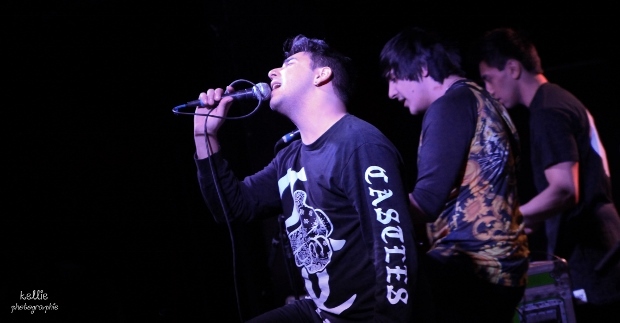 Palisades took the stage before Famous Last Words and featured songs from their 2013 album release, Outcasts. The crowd was all over the place and jamming out with the band as lead vocalist, Louis Miceli, sung his heart out. Palisades kept up the tempo throughout their set and the pace remained as Famous Last Words took the stage last in the lineup for the night. Famous Last Words, who you can catch at South By So What this upcoming March, ended the night on a high note. A fan even attempted a stage dive mid-set, although I’m pretty sure he dove straight to the floor…famous last fall? Famous Last Words didn’t disappoint and overall the evening was exactly what I needed – loud music, crazy energy, killer bands. The fans got an intimate show with their favorites and it’s great to see how Peabody’s has translated over to the Agora Ballroom. ‘The Ride or Die Tour’ has a few remaining dates, be sure to check it out on its way through your city and enjoy all the photos from this fun show below!